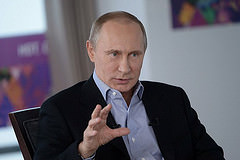 Many observers are speculating about Putin’s strategy in Syria. This commentary argues that Vladimir Putin’s military intervention is driven by five key objectives, with domestic, local, regional and global dimensions. Overall, it argues that Putin may have scored some tactical successes but that major strategic challenges still lie ahead. In the 2000 romantic comedy ‘What women want’, Mel Gibson played the character of an egotistic, insensible seducer. Following a bizarre accident, he becomes able to hear the thoughts of women around him and, as a result, to anticipate their deepest desires. These days, most Western officials and foreign policy observers wished they could become Mel Gibson’s character and read the mind of Vladimir Putin, in order to understand his policy and strategic objectives in Syria. Until such unlikely thing happens, we can only rely on our own educated guesses and speculations. Many articles have been published in the past few months, focussing on Russia’s intentions in Syria. From all these analyses, I have drawn my own list of possible objectives behind Putin’s decision to get more firmly involved in the Syrian conflict. In my view, these objectives go well beyond Syria itself, as they relate to many different agendas – domestic, regional or global. 1. A show for domestic consumption. A first objective of Putin’s campaign has more to do with Russia itself than with Syria. Foreign policy is always a good way to divert attention from the poor social and economic conditions at home – and Putin’s records are far from excellent. Furthermore, military actions are fully in line with Vladimir Putin’s carefully cultivated image of a strong statesman, at home and abroad. His approval ratings have never been higher since the Ukrainian conflict. He therefore wants to boost his domestic popularity through a show of hard power, not only in its direct neighborhood, but also beyond. In this light, Syria can be seen as the continuation of the Ukrainian campaign, but also as a way to distract public attention away from the scale-down of that campaign, from its critical assessment (what has Russia really achieved in Ukraine? ), and from the persisting international sanctions that are still in place as a result of this campaign – and which continue to bleed the Russian economy. The sequel of the Ukrainian conflict appears even more exciting than part one: in Syria, Putin can pretend that he is taking the lead in curbing regional instability and terrorism, gathering a regional coalition, and even dictating his own terms to the Americans and Europeans. This must sound highly impressive to a Russian audience. 2. Assad story. The ties between Russia and Syria go back more than four decades, when Bashar al-Assad’s father asked for military aid from the Soviet Union and gave them a Navy base in Tartus in return. Nowadays, this base is the unique Russian military asset outside the former Soviet space, bearing both significant strategic and symbolic values for Russia. Beyond material assets, Vladimir Putin is also clearly protecting a friendly regime, which was directly threatened by various local and international actors, while deepening ties with other regional powers – mainly Iran and Iraq. In times of geopolitical competition and geostrategic uncertainty, cultivating ‘special relationships’ is particularly useful. In addition, keeping in mind Libya and Ukraine, Putin may dislike the idea of yet another authoritarian regime being toppled – could he be next? 3. We care about terrorism too. Putin has framed Russia’s intervention in Syria largely in the context of the fight against the Islamic State (IS), a terrorist organisation. This was notably the case during his speech to the General Assembly of the United Nations last month. Such narrative is particularly compelling because it builds on Russia’s long-established interest and experience in fighting Islamist terrorism (notably in the Caucasus), but also because it fits perfectly the global narrative. Russia appears as an experienced and legitimate actor in what the Bush administration used to call the ‘global war against terrorism’. In turn, this potentially fulfils both a real security objective, as well as the communication goal of polishing Russia’s image internationally. It just kills two birds with one (big) stone. 4. Negotiating with jet fighters. Professional negotiators know that you should always aim to start a negotiation from a position of strength – and certainly avoid starting from a position of weakness. Vladimir Putin has repeatedly rejected the departure of Bashar al-Assad as a pre-condition for an international settlement of the crisis, citing Libya as a bad precedent. The current military support of the regime has de facto ended this discussion – a key objective in itself. Furthermore, one can speculate on possible links between negotiations on Syria and Ukraine. As Russia is negotiating with Europeans and Americans on these two issues, it could aim for some sort of linkages or tradeoffs between them (for instance removing jet fighters in exchange for lifting sanctions). 5. Russia’s permanent quest for status. Russia is obsessed with its international status. It has some ‘great power’ features, which Putin never misses to emphasize: it is the biggest landmass in the world, a major nuclear power, and a permanent member of the UN Security Council. In contrast, it appears sometimes as a ‘declining power’ with its ageing military capabilities, declining demography, and weak economy. It is also a ‘regional power’, which seeks to re-establish its influence in the region in light of competition from China and Europe. And it sometimes portrays itself as a ‘(re-)emerging power’, when it meets with leaders from the BRICS nations. Overall, Russia appears uncertain about its global status, often holding ‘great power’ rhetoric but actually behaving as a small or regional power. In Syria, Putin has taken advantage of a power vacuum to align its words and deeds and, above all, to get itself a seat at the main table (of great powers). Some experts have been rather enthusiastically calling the Russian President a brilliant strategist, notably judging on Russia’s new geostrategic position in the Middle East. In my view, however, this is way too early to assess Putin’s Syria/Middle East policy. Furthermore, Putin is encountering a number of challenges with regard to every objective mentioned above, which could altogether derail his entire foreign policy. First, Russia just started its operations in Syria. Past experiences show that stabilising an entire country can prove extremely costly and difficult – and there is no reason why Russians should find this any easier than Americans or Europeans. Given the complex situation on the ground, there is a real risk that Syria becomes some sort of a ‘quagmire’ for Russia, reminiscent of the Soviet debacle in Afghanistan in the 1980s. Second, whereas Putin is certainly deepening ties with some allies in the Middle East, it is simultaneously damaging some other important relationships, notably with Turkey – a key economic and energy partner. Syria may quickly prove a diplomatic headache for the Kremlin: welcome to the Middle East, Mr Putin. Third, the counter-terrorism rhetoric may be appealing, but it is also risky. Russia has now exposed itself to IS, which has called specifically for attacks against Russians and on Russian soil. A heightened terrorist threat could force Russia to re-orient its attention and resources domestically. Finally, Putin may have secured a position at the negotiating table for himself and for Assad, but the question is whether he can now convince Americans and Europeans to come back at the table? Overall, Vladimir Putin mastered a major tactical operation in Syria, keeping Assad in place for the time being. He also performed a major posturing success, finding his way back at the ‘great powers’ table without being invited. Whether Putin’s Syria policy will prove effective and beneficial in broader strategic and economic terms is less clear. Whether Putin knows what he is doing is equally unclear. From a European point of view, however, this has only limited relevance. What Europeans should care about instead are their own strategic interests in the region and how to secure them. Once they agree on that, they can decide whether Russia can be a partner or not. But right now, Europeans do not seem to know what they want. Perhaps they should ask Mel Gibson?